Identify the most recent national commitment on reducing greenhouse gas (ghg) emissions (Intended Nationally Determined Contribution INDCs) made by the country and the date on which it was made. The Netherlands is a member state of the European Union (EU) and therefore its emissions reduction target is set is in accordance to the EU’s ghg emission reduction regulations (The Government of the Netherlands). The Netherlands most recent national commitment on reducing ghg emissions (INDCs) was articulated by the Prime Minister Mansveld at the China Carbon Forum in Perking earlier this year. According to Mansveld “Switzerland and the EU have shown the lead in the world by producing their INDC. The Netherlands of course fully supports the EU’s aim of reducing emissions by at least 40% by 2030” (Government of the Netherlands 2015b). The Ministry for Infrastructure and the Environment (2014, pp 18) which is responsible for the Netherlands climate change policy in its latest report the “Climate Agenda: Resilient, Prosperous and Green 2014” stated that the nation’s ghg emissions reduction target is aligned with the EU’s goal to achieve ghg reduction of at least 40% compared with 1990 levels in 2030 and 80% in 2050. To ensure that this statement rings true, in the EU’s “2030 Climate and Energy Policy Framework” report published late last year, it indicated that the European Council endorsed a binding EU target of an at least 40% domestic reduction in greenhouse gas emissions by 2030 compared to 1990 levels (General Secretariat of the European Council 2014, pp 1). Also, all EU member states INC goals are to be compatible with achieving national emissions reductions of 80 to 95% by 2050 compared to 1990 levels and are to participate in this effort, balancing considerations of fairness and solidarity (UNFCCC 2014). The precise date of the “2030 Climate and Energy Policy Framework” report was the 24th of October 2014 and the decisions of the report are to be included in the Paris COP agreement in December of 2015. In the “Climate Agenda: Resilient, Prosperous and Green 2014” report, the Netherlands mentioned several times that it intends to limit the warming of the Earth to no more than 2°C (The Ministry for Infrastructure and the Environment 2014, pp 14). It believes that this is achievable by reducing the demand for energy, replacing fossil fuels with renewable energy sources, and by capturing and storing carbon etc. The Netherlands has various agendas and mechanisms to achieve its set INDC, some of which are unilateral such as the Local Climate Agenda, bilateral with the EU such as the EU’s Emissions Trading System (ETS) and multilateral such as the Partnership for Market Readiness PMR (The Ministry for Infrastructure and the Environment 2014; European Commission 2014). However, to this end it is impossible to quantitatively examine how the Netherlands ghg emission target links quantitatively to 2°C. Nevertheless, it may be possible to quantitatively examine how the Netherlands ghg emission target links quantitatively to a carbon budget; According to the Netherlands Environmental Assessment Agency (2011), in 1990, ghg emissions in the Netherlands were 223 Mt CO2 equivalent. A reduction target of 80% from 1990 levels implies a reduction of almost 180 Mt, in order to reach a level of 45 Mt CO2 equivalent by 2050 whereas a reduction target of 40% from 1990 levels equals a reduction of almost 90 Mt in order to reach a level of 134 Mt CO2 equivalent in 2030. This represents a huge challenge according to the Netherlands Environmental Assessment Agency, given that emissions have failed to decrease over the last 20 years in the Netherlands despite all the policy and technology developments (Netherlands Environmental Assessment Agency 2011, pp18). The Netherlands has not identified its consideration of equity and justice in determining its ghg emissions reduction target percentage level. The Netherlands has not specifically acknowledged that it not only has economic interests but also ethical obligations to those who are most vulnerable to climate change in setting its ghg emission reduction target. However, the Ministry for Infrastructure and the Environment in the “Climate Agenda: Resilient, Prosperous and Green 2014” report acknowledged that the most vulnerable and the poorest countries feel the effects of climate change the most, in many cases with consequences for water and food security. Therefore, the Netherlands aims to support global adaptation initiatives and wants to internationally share its climate knowledge in relation to water management and food production. For instance, in the Climate Smart Agriculture programme, techniques are being developed that will make the agriculture sector of vulnerable and poor countries more resilient to extreme weather conditions (dry periods, floods, and extreme temperature fluctuations) and that reduce greenhouse gas emissions. Furthermore, the Netherlands will continue to promote the availability of renewable energy in low-income countries and will help to bring about CO2 reductions through international forestry policy in these countries (The Ministry for Infrastructure and the Environment 2014, pp 28). In short, the Netherlands advocates strengthening long-term climate change resilience particularly in low-income countries and among vulnerable groups of the population and favours global tools ranging from financial aid for the reinforcement of investments by the private sector, insurance schemes, and the sharing of knowledge of data, observations, and best practices (The Ministry for Infrastructure and the Environment 2014, pp 28). In the Netherlands, the Ministry for Infrastructure and the Environment is chiefly responsible for environmental legislation and policy development. However, according to the “Netherlands National Communication under the United Nations Framework Convention on Climate Change UNFCCC” latest report there are other ministries and parties that are involved in the policy-making process such as economic sectors, consumers, advisory councils, research institutes, environmental protection organisations, and various trade unions and federations (UNFCCC 2014, pp 14); such as the Co-operative Programme on Water and Climate (CPWC), Institute for Environmental Studies (IVM), The provinces and the Association of the Provinces of the Netherlands (IPO), Ministry of Housing, Spatial Planning and the Environment (VROM), Netherlands Environmental Assessment Agency (PBL), Delft University of Technology (TUD) and Both Ends etc (Holland Climate House). None of these other major participants engaged in climate change policy formation have examined the Netherlands national INDC from an ethics, justice, or equity perspective. Nevertheless, Both Ends which is a broad coalition NGO of international and domestic NGO’s has expressed that people in developing countries are prone to facing the greatest difficulty due to environmental problems. Therefore, its objective is to help provide funds and other form of assistance to hundreds of environmental organizations in Africa, Asia, Latin America, and countries in Central and Eastern Europe. Its member NGO’s work in cooperation with local organizations in these places to start programs specifically focused on protecting and improving the management of river basins, forests, wetlands and dry areas. In sum, it works towards the ultimate goal to achieve a green, fair world where human rights are respected, and where nature and its resources persist in the long term and are accessible to everyone. To this end, Both Ends, its domestic member NGO’s such as Milieudefense and other major participants involved in climate change policy have not examined the Netherlands national INDC from an ethics, justice, or equity perspective. The national media has not explicitly covered issues concerning the national INDC with respect to ethical, justice, and equity issues. Nonetheless, the Dutch News is among the top national news media in the Netherlands and has covered issues on the Netherlands INDC climate change target. In its recent news report on climate change on the 24th of June 2015, it stated that the Netherlands government must reduce greenhouse gas emissions by at least 25% by 2020 compared with 1990 levels. This is according to The Hague court ruling made on a legal case that was brought to it by 886 Dutch citizens against the government’s unsubstantial efforts in reducing its ghg emissions according to its INDC target (i.e. 40% below 1990 levels in 2030). In the words of the court published on the Dutch News, “the Netherland government must do more to avert the imminent danger caused by climate change, also in view of its duty of care to protect and improve the living environment. The Netherland government should not hide behind the argument that the solution to the global climate problem does not depend solely on Dutch efforts, as a developed country the Netherlands should take the lead in this”. The legal case was spearheaded by Urgenda foundation, a civil society climate change pressure group in the Netherlands. According to the foundations member Marjan Minnesma as stated on the same Dutch News report “the court ruling also means people all over the world can seek justice; they can take legal action against their country for not combating climate change”. The same news was reiterated by other international news media such as Responding to Climate Change (RTCC), the BBC and even the US Guardian news (Dutch News 2015b; RTCC 2015; BBC 2015; The Guardian 2015). To this end, the national media in the Netherlands has not explicitly covered issues concerning its INDC with respect to ethical, justice, and equity issues. The Netherlands has made it clear that the actual basis for the aggressiveness of its INDC is sustainable economic development particularly through the use and production of renewable/clean energy sources. Its major focus is to completely stop the use of fossil fuels and other non-renewable source of energy that its economy is mostly dependent on as this has affected its efforts to commit to its INDC. It believes the market for renewable/clean energy and technology has great potential now and in the future, and therefore, believes its economy will benefit immensely from it (Government of the Netherlands). As stated in the “Climate Agenda: Resilient, Prosperous and Green 2014” report, the Netherlands “adapt and prevent” approach to achieving its set ghg emissions reduction target of 20% below 1990 base level by 2020 will yield opportunities for the Dutch economy and create jobs. There is a growing global demand for smart, clean and economical technologies and solutions to the consequences of climate change. This is where Netherlands wants to be a front-runner and Dutch companies are already doing business domestically and internationally in a climate intelligent way and thus opening up new niches and markets (The Ministry for Infrastructure and the Environment 2014, pp 6). 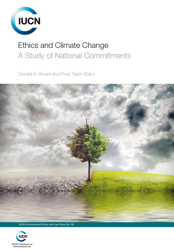 In the Netherlands, there are no known formal mechanisms available for citizens, NGOs and other interested organizations to question/contest the nation’s ethical position on climate change. As mentioned in the answer to question 5, the main responsibility for climate change policymaking in the Netherlands lies within the Ministry of Infrastructure and the Environment, however other ministries and parties which includes NGO’s are involved in the policy process (UNFCCC 2014). Nonetheless, as stated in the Netherlands biennial report to the UNFCCC, the Netherlands ensures public access to information. To this end, after adoption, all laws and underlying legislative arrangements in the Netherlands are published in one of several official government bulletins and/or directly on the website. The Freedom of Information Act and the Environmental Management Act also provide public access to information regarding the enforcement of environmental rules and regulations (UNFCCC 2013). Although the national policy on the environment is the responsibility of the Netherlands Ministry of Infrastructure and the Environment, provincial government is responsible for translating these guidelines into the regional context (Government of the Netherlands 2015a). However, information garnered thus far indicate that the provincial governments in the Netherlands have not acknowledged ethical responsibility for climate change. Their environmental goals and policies reflect concerns about sustainability of the local economy and conservation of the natural environment for the present and future welfare of the Netherlands and its citizens (The Province of Drenthe, The Province of Utrecht, The Province of Zuid-Holland, The Provinces and the Association of the Provinces of the Netherlands IPO). To be precise, according to “the Provinces and the Association of the Provinces of the Netherlands” IPO, the duties of provinces in the fields of environment, energy and climate is to ensure that the environment is safe and clean by working with municipalities to clean air and soil, and overseeing the production and transport of hazardous substances. Also, many provinces have climate and energy policy which stimulate the production of renewable energy and protect the countryside from the effects of climate change. They develop projects for rural areas that focus on strengthening nature, recreation, and agriculture, environmental and socio-economic vitality. They work with municipalities and civil society organizations and makes the policy and is responsible for the quality of the implementation of the policy by the various parties. The Dutch government has not taken any position on or otherwise encouraged individuals, businesses, organizations, subnational governments, or other entities that they have some ethical duty to reduce greenhouse gas emissions. Nonetheless, the Netherlands is striving for ambitious climate change solutions in association with the national and international business community, umbrella organisations of cities, local authorities, NGOs, academia and members of the public. For instance, the Netherlands is working together with organisations like the Dutch Sustainable Growth Coalition, the C40 Cities Initiative and the Climate Proof City and Local Climate Ambassadors coalitions as a means to transform itself into a strong and sustainable and low-carbon country (The Ministry for Infrastructure and the Environment 2014, pp 5). However, the Ministry for Infrastructure and the Environment (2014, pp 10) did mention that the adverse effects of climate change will undermine global efforts towards development, especially in poor regions. Therefore, as the World Bank advocates, it is a moral obligation as well as economically sensible to ensure ambitious action and inclusive green growth. The government should encourage educational organisations and institutions of all levels to teach environmental studies and with emphasis on the ethical and justice issues in relation to climate change. Likewise, the government should encourage other members of civil society such as businesses, industries, NGO’s, and other civil society organisations, especially social media organisations to raise public awareness on the importance of understanding and taking seriously the ethics and justice issues in relation to climate change. Also, the government should make it mandatory for provincial and other levels of government to include ethics and justice issues when formulating regional/local climate change policies. For developed nations, identify the most recent national commitment, if any, the nation has made on funding adaptation or losses and damages in vulnerable countries? In the Netherlands’s most recent national report to the UNFCCC (2014), it is stated that the despite the economic crisis that it committed €300 million as its contribution towards Fast Start Finance that was fulfilled at the end of 2012 and consists exclusively of mitigation and adaptation projects. Currently, the Netherlands contributes to the development of the Green Climate Fund, and is working on a scenario for gradually scaling up its finance towards its ‘fair share’ in the 2020 global climate finance objective of an annual 100 billion USD. Moreover, the Netherlands has contributed to climate-related activities through other multilateral, regional and bilateral channels such as the Asia Alternative Energy Programme, African Development Bank Energy Fund for Africa, UNDP and the US Department of Energy etc. Furthermore, according to the Netherlands government its contribution to climate finance may rise from €200 million in 2013 to €1.2 billion in 2020, based on a fair share for the Netherlands. It contributes money to climate funds, which finance adaptation and mitigation programmes in developing countries which include the Climate Investment Funds, the Least Developed Countries Fund and the Green Climate Fund (Government of the Netherlands). According to Jaardsveldt of the Netherlands news (2015), “the Netherlands is paying 100 million euros into the global Green Climate Fund which is to be used to help poor countries tackle the impacts of climate change”. Furthermore, the Netherlands is a member of the EU which is the largest contributor of climate finance to developing countries, providing more than half of global official development assistance (European Commission 2015a). The EU’s Global Climate Change Alliance GCCA initiative provides technical and financial support to developing countries to integrate climate change into their development policies and budgets, and to implement projects that address climate change (European Commission 2014c). According to the European Commission (2014b, pp 4), the EU’s budget has steadily increased climate finance for developing countries. The total yearly amount of climate relevant grant funding increased from around €400 million of grant funding in 2007 to €900 million in 2013. The EU has provided substantial support to climate change mitigation, adaptation and REDD+ action in developing countries within its bilateral cooperation programmes with individual countries, in regional and sub-regional programmes and in joint initiatives such as the EU-Africa Infrastructure Trust Fund ITF, the Latin America Investment Facility LAIF, and the Caribbean Investment Facility CIF etc. What’s more, the European Commission (2014, pp 61) acknowledges the Netherlands as a major contributor to the EU’s climate finance. For instance, in 2013, 60 million of the Netherlands climate finance was spent within the framework of bilateral climate finance to countries such as Burundi, Mali, the Palestinian Territories, Rwanda, South Sudan, Yemen, Bangladesh, Benin, and Ethiopia etc (European Commission 2014, pp 62). For developed nations, did your nation acknowledge any ethical or justice based responsibility for making a commitment on funding adaptation or losses and damages in vulnerable countries? The Netherlands recognises that developing countries will be the first to feel the impact of climate change, and the poorest people will be hit hardest by the impact of climate change (Government of the Netherlands). As a result, the Dutch government wants to reach international agreement to be concluded in December 2015 at the UNFCCC Paris conference in 2015 to reduce the ghg emissions, supports development programmes that aim to increase developing countries’ access to sustainable energy, is committed to preventing deforestation and is working on development cooperation that also takes climate issues into account, in relation to water and agriculture. To this extent the Netherlands has not acknowledged any ethical or justice based responsibility for making its commitment on funding adaptation or losses and damages in vulnerable countries. Have NGOs or the media in your nations identified or discussed the potential obligations of high-emitting nations to fund adaptation or losses and damages in poor vulnerable nations? In the Netherlands, the NGOs have somewhat identified the need to assist poor vulnerable countries in adapting and mitigating climate change as mentioned in the answer to question 5. The news media on the other hand has not identified or discussed the potential obligations of high-emitting nations to fund adaptation or losses and damages in poor vulnerable nations.